The MR run Objective Racing Bathurst 12-hour campaign came to an abrupt end after just 2 hours into what was set to be a break-through event for the team. It was an amazing opportunity for McElrea Racing and it's drivers to compete against the best Professional GT teams and drivers from all over the world. And while the end result was heart breaking; it was acknowledged by many racing regulars that our one-car outfit punched well above it's weight all weekend. 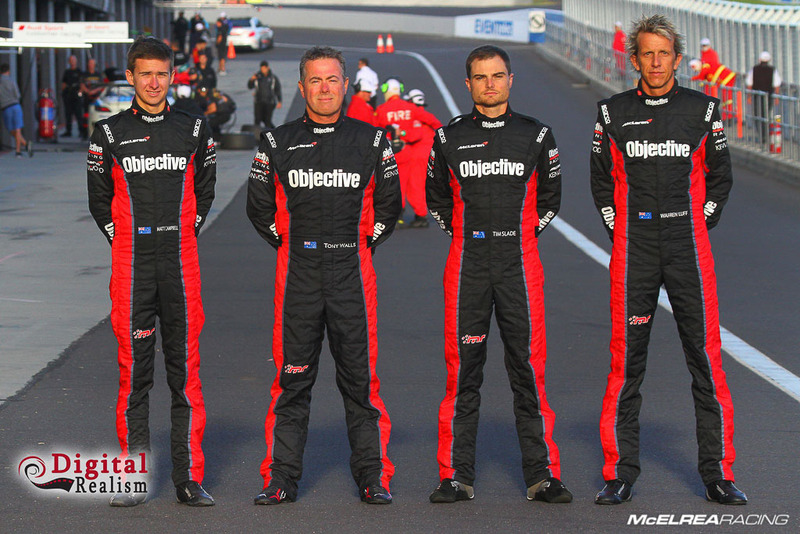 Regular MR drivers Tony Walls, Warren Luff and Matt Campbell were joined by V8 Supercar ace Tim Slade. Sladey was a welcome addition to the team and he fitted well from our very first test together. We arrived at the legendary Mt Panorama circuit on Wednesday and had a big day setting up the flooring, pit walls, lighting gantry, monitors, fuel-rig and various other components that make-up the Objective Racing setup. This later confused many of the spectators, who mistook us for a leading European team, based on the level of our presentation and professionalism. This is testament to the way Tony Walls goes about running his racing program and his investment in doing things properly. There were two classes within the 'A Class' category this year, 'Pro' class for teams with only Professional Drivers and 'Pro-Am' for teams with a maximum of two seeded Pro-drivers. It was our focus to win the 'Pro-Am' category and if we achieved that we were confident of a strong outright result. Luffy topped the time sheets in the first practice session with a very strong 2:03.77. This was really pleasing but rest assured there was no sense of complacency within the team. 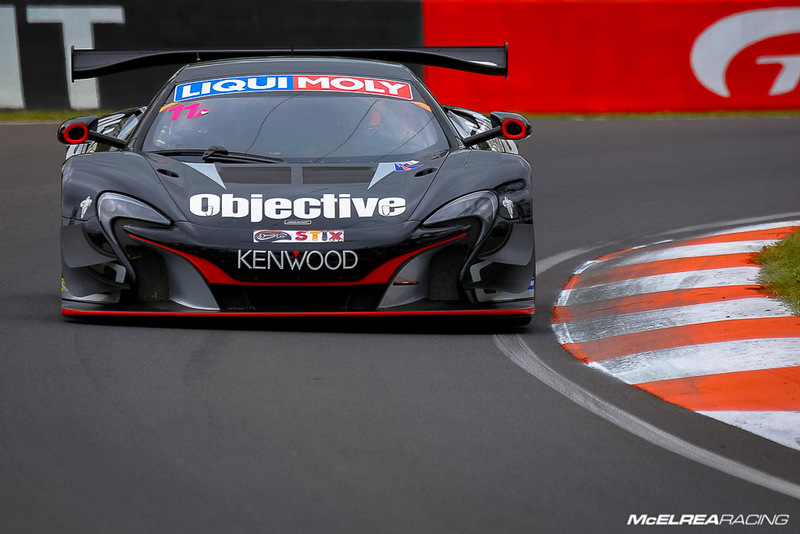 The second session was all about getting Wallsy comfortable in the car and re-learning the track in the beast that is the McLaren 650S as it is very different and considerably faster than anything he has driven at Bathurst before. In the third practice session Tim and Tony shared the car and we ended up with a 2:04.04 placing us 4th outright and first in the Pro-Am class. 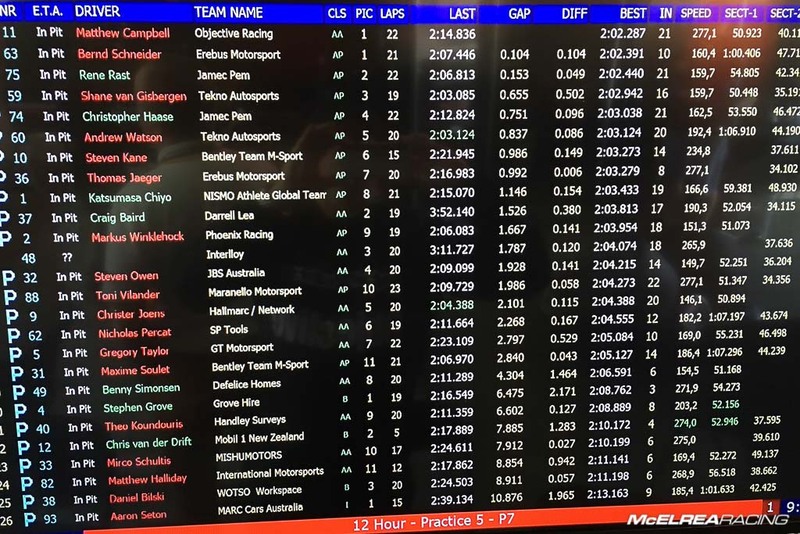 In the 4th practice session Tony and Matt shared driving duties and we ended up 14th outright and 4th in Pro-Am after encountering plenty of slower traffic and very few clear-lap opportunities to post a competitive lap time. 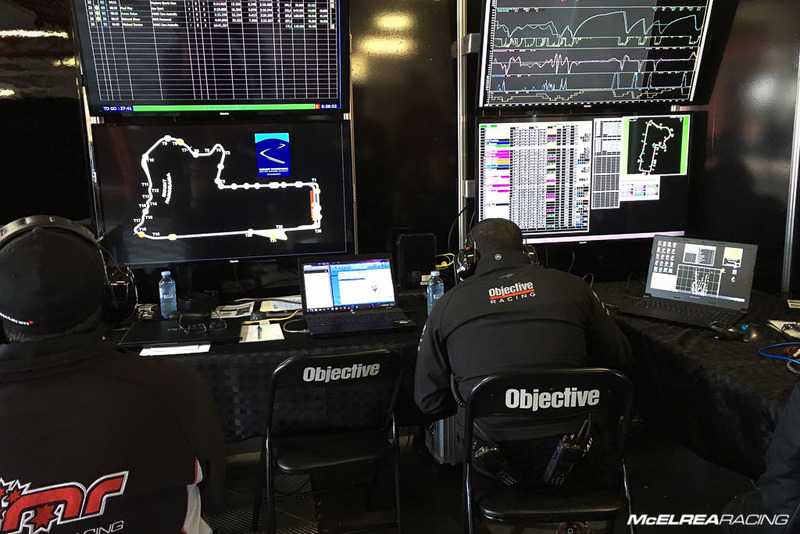 The 'Engineering Department' in full-swing reviewing the streams of data to ensure that the Drivers had the very best setup and information available. On Saturday morning we had our final practice before Qualifying started at 12.50 pm. Tony Walls and Matt Campbell both drove with Tony posting a very credible 2:06.82 putting him in the top three out of the semi-professional drivers. He then handed over to Matt who was able to get a clear lap resulting in a new lap record and an incredible lap time of 2:02.87. Given Matt's comparative lack of experience this was an amazing result to record a better time than some of the world's top GT drivers!! In qualifying we ran Luffy and Tim who had not had much seat time on Friday as both of them had gotten up-to-speed really quickly in their first sessions! 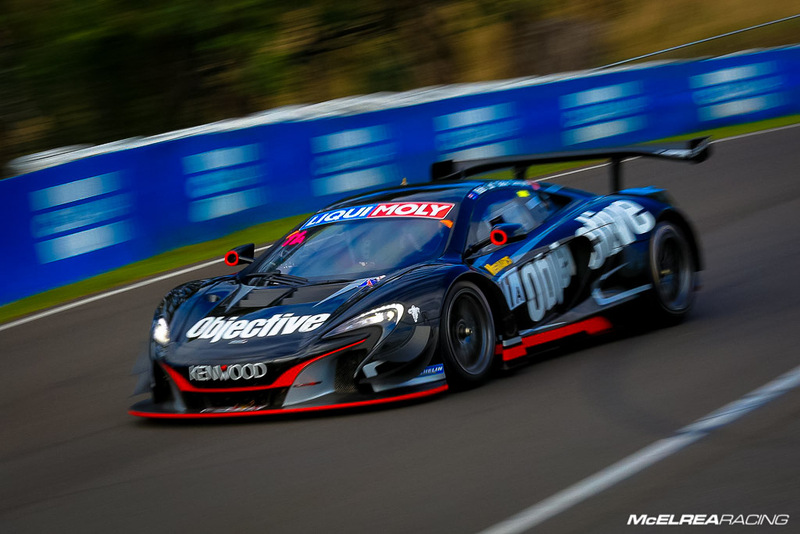 At the end of Qualifying Luffy had posted a remarkable 2:01.88 to put the Objective McLaren on the second-row in p3 for the start of the 2016 Bathurst 12 Hour! The race started at 5.45am on Sunday morning and Luffy started, with the plan being a double-stint to hand-over to Tony for his (2-hour) double stint followed by Matt, then Tim. Luffy did a great job running in the top three even leading for a short while after the first round of fuel stops. Once the race had settled into a rhythm, Luffy was less than two seconds behind the leader (and eventual winner) Van Gisbergen and around ten seconds clear of third place. Unfortunately, just before the end of his session he brushed the wall on the right side of the track after Skyline, which fired the car into the wall on the left side. There was too much damage to safely fix it in the time available so we unfortunately had to retire. As usual the awesome MR crew worked their butts-off all weekend and we were always among the first to arrive and the last to leave the circuit, spending the extra time to get the setup as close to perfect as possible, double-checking systems, mechanical checks and of course plenty of driver-change, refuelling and pit-stop practice. the Porsche Carrera Cup and the Australian GT Sprint Series at Clipsal (in Adelaide) on the 3rd of March. Thanks to everyone for your support and we are looking forward to seeing and hearing from you all again soon!! Founded in 2009 by Andy McElrea, McElrea Racing is the realisation of Andy's dream to run the best customer race team in the Porsche Carrera Cup and Australian GT. 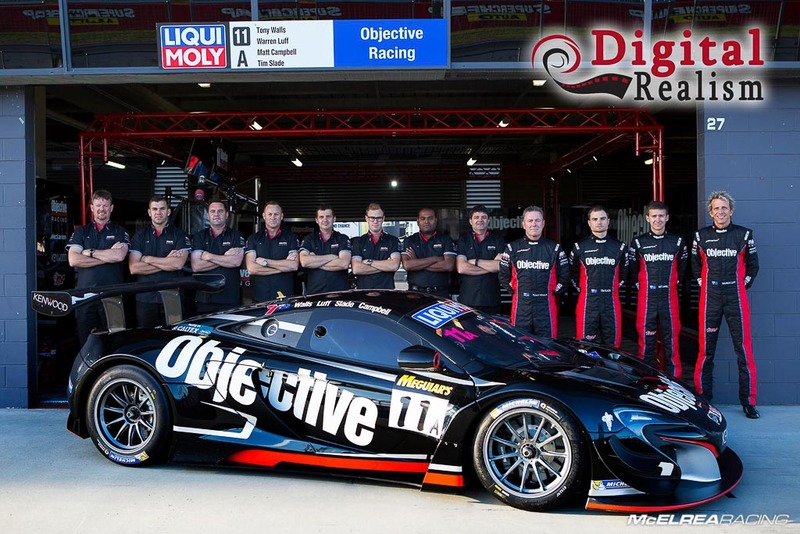 After ten years of competing at the top level of Australasian motorsport 'MR' has established itself as one of the most professional and successful racing service providers outside of the V8 Supercar Championship. We currently compete and win in the Australian GT, Porsche Carrera Cup and GT3 Cup Challenge championships.